I left home Wednesday on one of those glorious sunny spring days with the temperature headed for a high in the 70s and almost no wind. 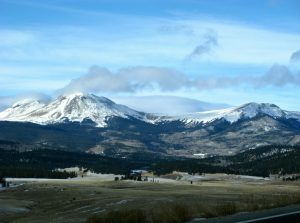 The peaks stood out crisply white against a bluebird sky. I watched idly for wildlife as I cruised across South Park, winding up and over three high passes. 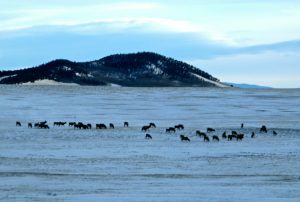 I spotted mountain bluebirds, ravens playing on the wind, red-tailed hawks soaring in lazy circles as they scoped the mountain grassland for prey, and a herd of about 50 cow elk grazing near a looping stream. All very bucolic. 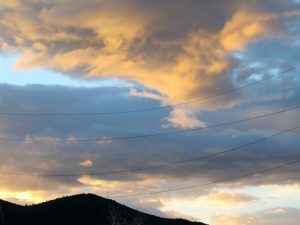 When I drove home last night, fluffy clouds draped the highest peaks, the wind was blowing hard out of the southwest, the bluebirds had found shelter, the hawks and ravens were perched, and the herd of elk had swelled to 200, bunched tight as commuters waiting for a subway train. The wild ones were preparing for a storm. Dawn clouds hint at a storm coming. This morning dawned still with fat clouds clogging blue sky. Over the course of the day, the wind shifted to the southeast and the temperature dropped steadily from 46 degreesF at dawn to 29 degrees. Around noon, rain splattered the windows as a shower passed by. Then came the rattle of hail, loud on my metal roof and photovoltaic panels. After the hail came flakes of wet snow. 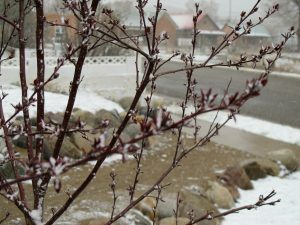 Snow clings to tiny crabapple leaves. 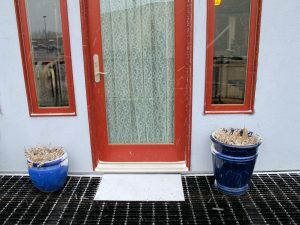 Showers of snow blew past, none sticking—the ground was still warm from the balmy weather earlier. Until the temperature fell far enough that a thin white veneer accumulated on roofs, fences, lawns and cars. After finishing my outside chores, I spent most of the day cozily inside, catching up on bills and taxes and other details of household life, happy at the drizzle of moisture. As dusk fell and flakes continued to spill out of gray-bellied clouds and the pavement shone with water, I curled up on the couch, feeling rich. Not in the financial sense. 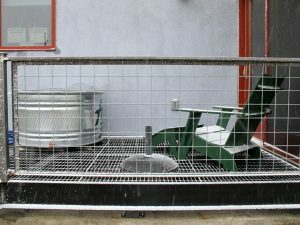 Wet snow begins to coat the grating of the deck and the chair. Rich in abundance. This wet snow probably hasn't totaled more than a quarter-inch of precipitation, which may not sound like much. It's enough though. Enough to fill the air with moisture and the smells of life waking up—the microbes in the soil exhaling at the touch of life-giving water, the plants breathing a sigh of relief because for the moment, they aren't losing more water vapor to the air than their roots take in; the earth itself welcoming moisture and life. That rare-for-here feeling of water-saturated air plus the heady fragrance of respiration make me feel rich, like opening the pantry door in winter and seeing jar after jar of food. Rich in life, rich in spring, rich in the joy of water where water is always scarce. That feeling of abundance reminds me that I am rich in other ways: Rich in nurturing family, friendships and love; rich in having this cozy home to return to after exciting and exhausting work-trips. Rich in the seedlings sprouting on the windowsill (tomatoes and basil for the kitchen garden) and outside under sheltering layers of mulch (wildflowers and native grasses that will weave their living tapestry over my formerly unloved industrial yard). 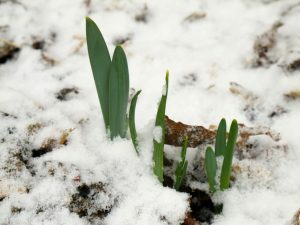 Rich in daffodil leaves sprouting through the snow. I don't always feel rich. Sometimes I feel impoverished, worn down and sorry for myself from the continuing effort to figure out this unlooked-for life as Woman Alone. Just now though, writing about my quiet joy with the snow still falling in a thin rain of flakes outside, I think perhaps what makes my existence worthwhile is precisely that ability to feel joy, to see the beauty and promise in an April snowfall. That I can rejoice in the abundance of life in this moment is itself a gift worth celebrating. And practicing for those times when it does not come easily.